Ben Carson: The World Was Created in 6 Days. Literally. His beliefs could have real political consequences. Ben Carson, one of the top-tier contenders in the GOP presidential primary, has long been known as an ardent creationist. He has debated prominent scientists who defend evolution, and it's no secret that his advocacy of creationism springs from his deep faith in the Seventh-day Adventist Church, a Christian religion established in the mid-1800s. Creationism is a core belief for many Seventh-day Adventists, and one of the religion's founders, Ellen White, was one of the first purveyors of the notion that the Earth is merely 6,000 years old. This week, Carson, a retired neurosurgeon, took some heat for his creationism when Buzzfeed reported that during a 2011 lecture that was part of a "Celebration of Creation," Carson decried the Big Bang theory and asserted that Darwin's theory of evolution was "encouraged" by Satan. In that talk, Carson did take slight issue with White and those creationists who claim the Earth came into existence just several thousand years ago. He noted, "I am not a hard-and-fast person who says the Earth is only 6,000 years old." 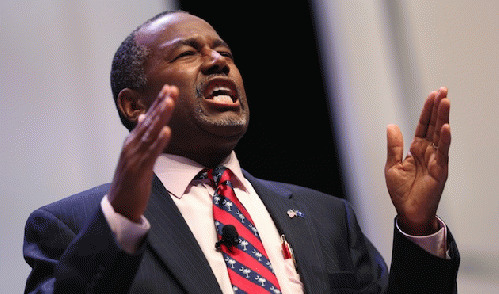 Yet Carson quickly added, "I do believe in the six-day creation." And he meant literally six days, not metaphorical days -- that is, not days that might have lasted millions of years. Go to Mother Jones to read the rest of this article. Can Obama Disrupt the Shutdown Narrative?